Jim Steranko Captain America #113 Alternate Unpublished Cover Original Art (Marvel, 1969). Steranko did just three Cap covers, and only about 40 published covers total during his late 1960s/early 1970s heyday, meaning there are too few originals to meet collector demand. And the reason for that demand is the artist's incredible design sense. He certainly "pushed the envelope" of what could be done in comics. 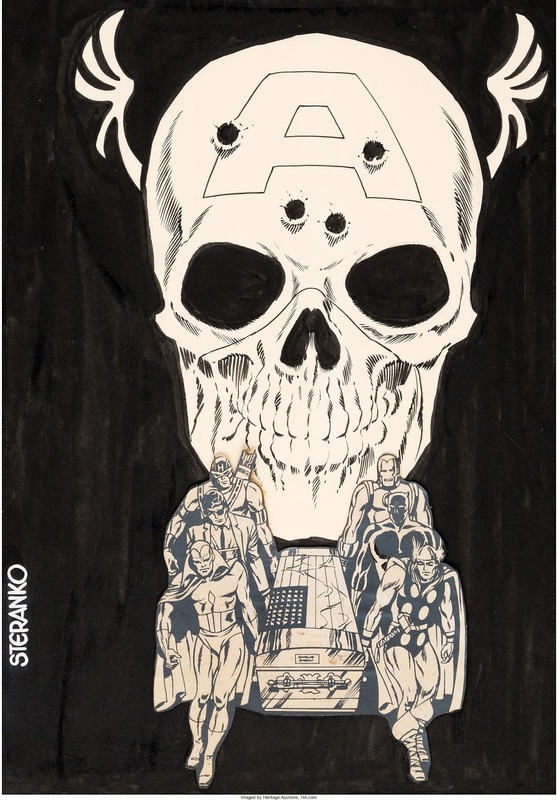 David Spurlock's book Steranko: Arte Noir (2002) pictured this cover and noted that the artist "contrived The Death of Captain America, which he hoped to project over several issues as a major event, and submitted a showcase cover of stark, jolting intensity. Stan Lee rejected the art as being too 'shocking' for the Marvel line." The author goes on to note that the planned storyline was compressed into one issue, #113. 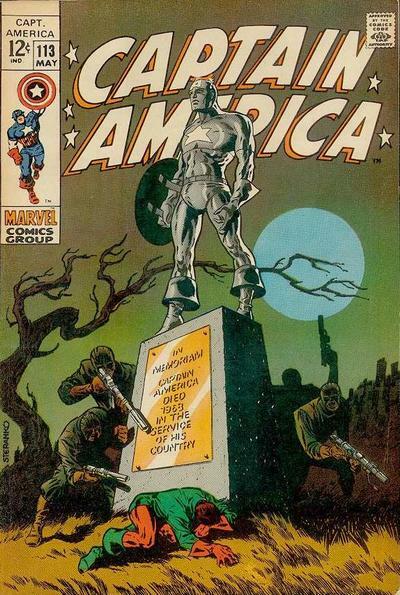 Of course, the cover that was later used was itself a classic, with Rick Jones mourning at a memorial of Cap. Here, Cap is mourned by pallbearers Nick Fury, the Vision, Hawkeye, Thor, the Black Panther, and Iron Man (please note that all of the hero figures at bottom and the coffin are a stat, not original art).